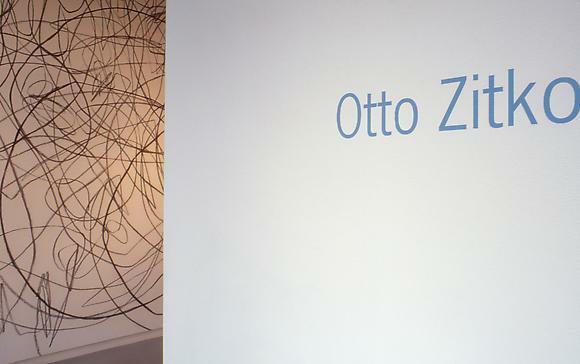 Cheim & Read is pleased to announce the first exhibition in the United States of works by Otto Zitko. Born in 1959, Zitko lives and works in Vienna, Austria. His work was most recently seen in d'APERTutto at the 48th Biennale di Venezia where he presented a large drawing installation. Zitko …, after a period of drawing on glass covered with soot, turned to space itself and started drawing on walls. He strives to create a symbiosis with the given space and his arsenal of graphic possibilities. Thanks to the transformation of the elements defining space into supports of his drawing, the space begins to vibrate. His ductus becomes an intervention and is controlling and eruptive, linear, discursive, nervously entangled and dense, seismographic and full of destiny. He thus imbues the space with "polyphonic speaking", ringing with sounds even. Here, as only charcoal is used, its resounding is reminiscent of the drums in the films of Buñuel. Paul Klee defined the line as a measurable formal element and in it, he saw the main way and the byways. Zitko sets this kind of definition on the level of pedagogic fairy-tale and with great skill and complete awareness, he creates a type of drawing we might call a Passzeichnung-if we borrow the term Franz West uses for his embodiments of physical neuroses in form and figure-an energetically present, albeit not authoritarian world of scribbles, nests, interlacing lines of force that are bound to run into haphazard situations, and which resembles a ball of wool in the clutches of kittens. No leitmotif is repeated, there is no allover structure to threaten the visitor, and no royal way captures his eye-instead of this, the door is wide open to the pleasures of an earthy musical drama and to the disintegration of space. At Cheim & Read, Zitko will present an on-site wall drawing in the front gallery with recent works of oil on aluminum panels in the second.